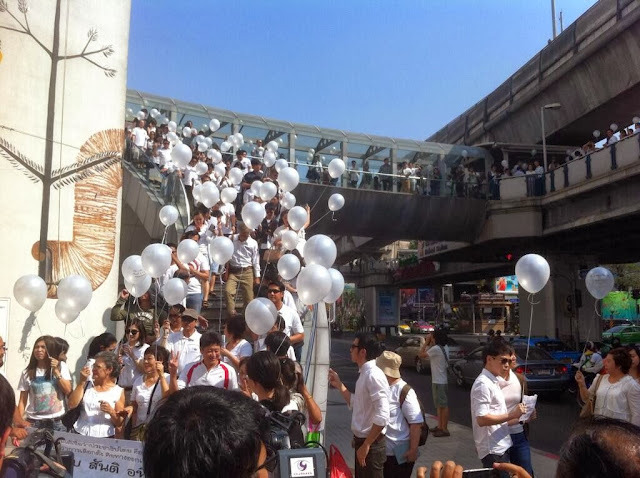 January 5, 2014 (ATN) - A hundred or so people clad in white t-shirts calling themselves the "Ants' Power Group" gathered near the Bangkok Art and Culture Centre (BACC) to release white balloons as part of a "People Going to Vote" event. The absurd demonstration is in support of upcoming sham elections in which accused mass murderer and convicted criminal Thaksin Shinawatra will once again be running by nepotist proxy. The country’s most famous fugitive,Thaksin Shinawatra, circles the globe in his private jet, chatting with ministers over his dozen cellphones, texting over various social media platforms and reading government documents e-mailed to him from civil servants, party officials say. There is no question that an accused mass murderer and convicted criminal hiding abroad (usually in Dubai) from a 2 year jail sentence, multiple arrest warrants, and a long list of pending court cases, is illegally running Thailand by proxy. In addition to supporting an illegitimate single-party election featuring an unqualified defacto party leader not even residing in the country, the "Ants' Power" demonstration also attempts to frame anti-regime protesters as being "opposed to elections." Image: White balloons for sham elections. A hundred or so people gathered in downtown Bangkok amid much larger anti-regime protests, to support the current regime and their single-party election planned for February 2, 2014. All opposition parties have boycotted the election, featuring deposed dictator, accused mass murderer and convicted criminal Thaksin Shinawatra running as defacto party leader. While the group, calling itself "Ant's Power" attempts to appear as "pro-democracy" advocates, they are simply regime supporters who have exchanged their red shirts for white ones. In reality, anti-regime protesters have been fighting for elections - elections conducted legitimately and without Thaksin Shinawatra or his proxies involved. If "Ants' Power" was truly dedicated to the principles of representative governance, they would recognize the illegitimacy of single-party elections run openly by a convicted criminal. They too would be demanding the removal of Thaksin Shinawatra and his family's unwarranted influence from Thailand's political landscape before legitimate elections could proceed. That they aren't indicates they are merely the regime's "red shirts" resorting to increasingly desperate measures of deception to repackage and sell their unwanted agenda to both the Thai public and to international audiences.